Whether you are fishing at night, cruising trails on your ATV, or want more lighting in your truck, this 1.5 x 3 Inch RGB LED Accent Light provides endless RGB color options. Our accent lights can be used individually or combined with other accent light to provide even more light. 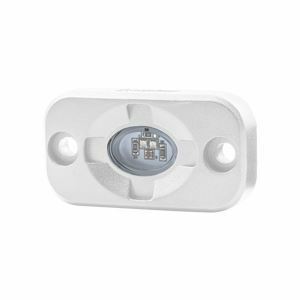 The white die-cast aluminum housing with a polycarbonate cover is virtually indestructible. With a 10 foot long cable, you will have no problem reaching the area you need illuminated, longer applications make use the waterproof 10 foot extension (HE-EXTRGB). This accent light provides 720 raw lumens from three 3 watt Cree LEDâ€™s and has a 120 degree beam pattern. This RGB accent light plugs into the Heise control box (HE-CBRGB).